Who knew that positioning a word in one continuous ring would make it so tricky to read? The challenge in WordARound is to quickly figure out where the word starts and to read it aloud before your opponents. The game seems so simple, but you’ll find yourself baffled as you race to spot and call out words! 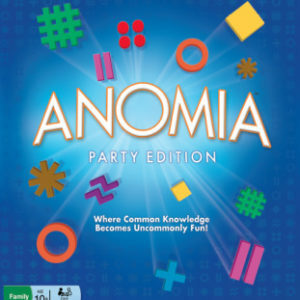 This is a fast-paced game that is fun for groups. Word a Round builds vocabulary and improves concentration and it’s compact storage box is perfect for travel! Shuffle the circular cards and place them in a single stack, face-up, in the centre of the playing area. Make sure the card stack is visible to all players. When the card stack is first laid down, the dealer should keep his or her hand on top of it, covering the top card so no player can peek. Once all players are ready, the dealer removes his or her hand and the game begins. All Players look at the card on top of the stack and race to correctly read and call out the word written in the black ring. Note: The first card of every game starts with the black ring. If you are first to correctly identify and call out the word, you win the card. The first player to collect 10 cards wins.